30 years of McDonald's - I'm lovin' every bit of it!! Congratulations! McDonald's Philippines. Thank you for 30 good years of burgers, fries and great memories. Admittedly I am a Mc Donald's baby, I remember my first encounter in McDonald's in Sta. Cruz way back in 1980's and I just fell in love with their french fries, until now I still go gaga for their fries. With that McDonald's celebrates 30 years of being part of all Filipino's lives, changing them, touching them and giving each a memory to cherish for all time. Thus, McDonald's Makati Cinema Square, Greenhills, North Avenue, and Quezon Avenue will once again open its doors to customers simultaneously today Sept. 30, now bearing new modern designs setting the tone for the next 30, 60, 90 years of McDonald's in the country. Each of the 4 McDonald's anniversary stores will give loyal customers more reasons to say "love ko 'to" with stylish furniture, colorful interiors, and dynamic graphics that perfectly suit the tastes and style of the modern Pinoy. Not to mention freebies and giveaways for customers all day long! So visit McDonald's anniversary stores on September 30 and join the celebration of three decades of great-tasting food, excellent service, and, now, a whole new kind of dining experience only at McDonald's. Along the long stretch of Maginhawa St. near Quezon Memorial Circle towards U.P. Diliman, a vast pool of mini eating places, restos, hang-out places and even social drinking spots have seen light, and is making Maginhawa street indeed one of the must-go places to visit for a quick fix, or even a barkada night out. And with that in mind, we got to try Alfahkr's Persian Food. Pronounced as it clearly spells, the name traces its roots from Arab meanings. Though it has indeed carry a name hard to forget. Aside from the usual appetizers Hummus (P45) with pita bread (P10) and Grilled Persian Chicken in breading. Among the other favorites for appetizers include Ox Brain at P60.00 (left) and Keema Platter (beef) at P60.00 as well, best with spice and Alfahkr's very own garlic sauce. As I was taking pictures and appreciating the appetizers presented to me, something caught my attention, that great smell of grilled meat! Ah Yes, The Chicken and Beef Kebab Combo, 2 grilled goodness of delicious tender beef and juicy chicken kebab. Hot and fresh just the way I like it. What is Persian food without grilled tomatoes, right? Yummy. Delicious looking wouldn't you agree? With a choice of Pita Bread or Buttered Rice, smoother it with Garlic sauce, you just know you will be in for gastronomic treat. Priced at only P125.00 is definitely a steal. And the main event of the evening Alfahkr's Lambchops, Australian lamb basted in Alfahkr's secret marinade and grilled to perfection, trust me you really have to try this. And what's best about it is you won't even spend a fortune for that tasty piece of lamb. At only P165.00, it has become one of the best sellers of the house. Just tell them you want it grilled fresh, full of flavor and perfect with their yogurt shakes in plain, strawberry, mango or banana flavors. The New World Hotel in Makati City, Jasmine Fine Cantonese cuisine cordially invites you to experience a culinary treat like no other. Savoring Cantonese cuisine from renowned special guest chef, Wong Kam Chung from Shanghai, China. This September, discover Chef Wong Kam Chung from Shanghai's renowned YUE 1525 restaurant, as he showcases Cantonese cuisine as you have never experienced here in the Philippines. With fresh produce and ingredients flown in from different parts of the world to give you that satisfying degustation. All part of his creations, Chef Wong came to Shanghai to open YUE 1525 directly from Hong's famous Dragon King Restaurant in Wanchai where he was head chef for 5 years, especially known for his home-grown favourites of claypot dishes and double-boiled soups for which the Cantonese are well-known. Enjoy the best food in this posh and modern Chinese restaurant setting here in the metro, relish the sights and sounds in true Chinese setting, hearing hymns and songs that are reminiscent of those in Hong Kong and China. A treat for the senses. Enjoy utmost privacy with special function rooms to cater for special occasions and functions. And now let me showcase to you why Jasmine is one of Makati's most sought after Cantonese Cuisine restaurant. ** helping out some students of U.P. I.E. Club in their upcoming food event. 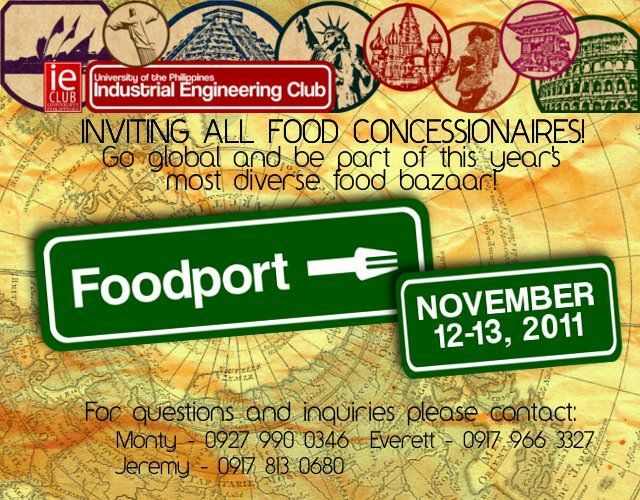 This coming November 12-13, 2011, our organization will be holding FOODPORT, a food fair exhibiting cuisine from various countries and cultures, to be held at the Christ the King Parish Multipurpose Hall, Greenmeadows Avenue. 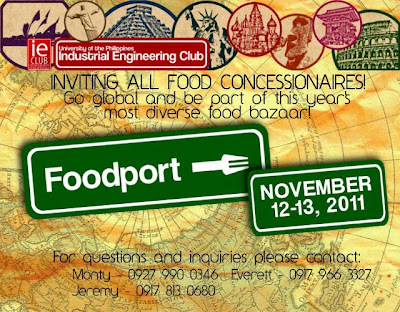 FOODPORT targets the growing local demand for foreign flavors. Proceeds from the event will benefit the UP IE Club Scholarship Fund, our beneficiary, which sends bright but underprivileged students through college. Let's support the entrepreneurial strive of these students as they embark on real life after college. Great food finds will surely abound. Showcase your best food stuff and be the next new food find. There is an Early Bird Discount for those who will reserve on/before September 30. The Food club chanced upon to visit Nomama in Scout Tuazon, even before the resto diner formally opened its doors just this September. We were privileged to be the first few to have experienced Nomama in their soft opening, with Chef Him Uy de Baron personally cooking us dinner. Hmmm what a treat! Nomama is a no-nonsense Japanese fusion resto, with all things as basic as they come, no fancy furnishings, just comfy seats, perfect lighting and great food. You would be amazed that even though it is set as simple as it is, you can't help but notice the simple, elegant yet functional details of the place. The kitchen oh so clean and arranged, where you get to see all your food prepared right before your eyes. I love buffets, even though I don't eat as much as I used to... well I guess it comes with age, and well I'm not getting any younger right? But since it was a special day, my father-in-law's birthday, we decided to try a buffet place that we have yet tried. Of course we have the usual major hotel buffets in The Spiral at Sofitel, Heat and Circles at Edsa and Makati Shangri-la and the Mandarin Oriental and even Vikings in SM Mall of Asia, are among my favorites. But even though they are all good and give that extra service. There seems to be something that I want to have when I have my buffets, and that is quiet and pleasurable dining, most buffets seem like a battleground, and everyone is like they have not eaten for a while to prepare for that buffet. So it ends up with you not enjoying your meal at all. But all this has changed when Midas Cafe came along. With lavish interiors and posh lights, with wall to ceiling windows for you to enjoy breathtaking views while you dine away the time. Just look at the pictures, they speak more. O'pollo Grilled Chicken and Burgers! - A Chicken lover's paradise! O'pollo Grilled Chicken and Burgers (pronounced as Apollo with an "O"), is an all chicken fast-food chain that has recently opened its doors to Filipino consumers. A completely Australian concept based from the owner with a touch of Pinoy. I have been passing by E. Rodriguez for quite sometime and noticed a big letter "O" and was curious to find out what have I been missing here? The place was very neat, had high ceilings which gave it a very refreshing feel, lots of tables and chairs to sit on, and very friendly staff, as all fast food chains must have. So let's cut through the chase and order something. YUMMY magazine did it again! 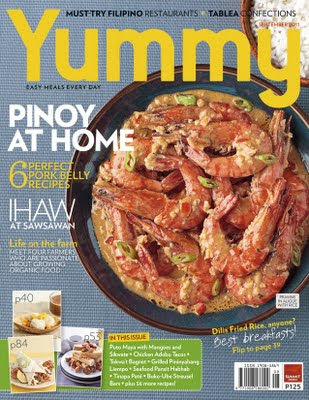 Capturing the appetite and hearts of Filipinos all over the world with their September issue - making it known why Filipino foods has been winning the hearts of food lovers all over the world. Start your day with new and creative takes on Filipino almusal favorites like eggs, dilis and tinapa. YUMMY! Then, fire up that grill with nine easy recipes for grilled dishes and savory sauces. YUMMY also shows you how to cap off your meal with dessert recipes you can whip up with tablea. Eager for some pasalubong? 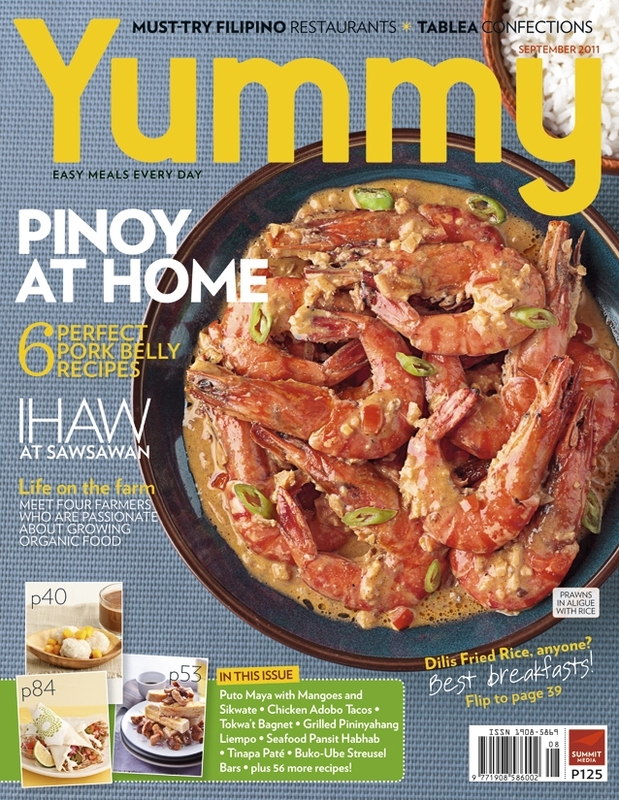 YUMMY magazine features six creative recipes using native ingredients from different parts of the country, from Laguna’s kesong puti to Davao’s dayap. This issue also compiles six recipes perfect for liempo or pork belly and use this Pinoy favorite for appetizers, sandwiches and even pasta dishes. Plus, YUMMY brings tinapay and palaman to a whole new level with ten ideas for Pinoy sandwiches. Aside from an overload of Filipino recipes to take you from breakfast to dinner and all the meals in between, YUMMY is also giving away P45,000 worth of goodies this month! For more details, grab a copy of the September issue of YUMMY magazine, available nationwide. For more of YUMMY online, visit www.yummy.ph, become a fan on Facebook via Facebook.com/yummymagazine and follow them on Twitter via Twitter.com/yummyph. Mooncakes 月餅 anyone? For the year 2011, The Mid - Autumn Festival or better known as the Mooncake festival falls on a Monday, this Sept. 12, 2011. It started way back during the Chinese Dynasties, with traditions and practices passed from generations to generations, from old time simple mooncakes and simple celebrations, to more than a dozen kinds of mooncakes, and more exotic varieties to choose from. Mooncakes 月餅 - nowadays even have flavors that include Pandan, Ube, Chocolate and the classic Black mongo and Red mongo. I even came across mooncakes that have ice cream in them. I remember I even brought home a box of 4 from Hong Kong and then bringing it back for my mom and dad to taste. It is such a shame though that the mooncake festival, considered as the second most important holiday in the Chinese calendar (next to Chinese New year) is not so much celebrated here in the Philippines. Unlike in China, Taiwan, Hong Kong, Malaysia and even Singapore, where the festivities lasts for more than a month, family bonding time and a celebration of mooncakes as well. But Chinoys in the Philippines do still practice that tradition, even in their own simple ways. Other than the gift of mooncakes to family and friends, there is also The Dice Game. Where family members play for the roll of the dice with corresponding prizes to be given away. So what is this post really about? Well, this is a food blog, then it definitely and must be about mooncakes! I still remember the days when mooncakes which were sold in Far Eastern Restaurant in the 80's and now Royal Garden, were having long lines for their mooncakes, considered as the best in town. I myself have experienced waiting in line for 2 hours before I was able to get my mooncakes. But times have changed, and even though they still do sell mooncakes, a large market for imported mooncakes from Hong Kong and Taiwan have arrived to our shores, and can be seen in almost all major supermarkets in the metro, unlike before where you can only get mooncakes in Chinatown. So what do we have in mooncakes that is making everyone crave for one. Well first of all, you have familiarize yourself with terminologies only heard in the language of Mooncakes, with such terms as Lotus and Yolk, you might mistake yourself on why such a mooncake is more expensive than the others. Most part of the mooncake is like mongo paste filing. But new ones even include white beans or red beans. And so far as I have seen from the stands here in Chinatown, Hong Kong brands have been up for the past few years, with exotic flavors such as Abalone and great packaging as well. But in my case, Eng Bee Tin, for me makes the best mooncakes which fit the Filipino Palette. A little sweet but just enough to keep you craving for more. On their stands are the classic black mongo beans mooncake, the white bean mooncake, the red bean mooncake and the newer ones include ube mooncake, pandan mooncake and more. With your choice of 1 yolk or 2 yolks, the yellow in the middle is the yolk. They even have white lotus, Mixed nuts, Ham and nuts and more! Just see how many combinations you can make with these mooncakes. So head out to Chinatown and get the best 月餅 mooncakes in town. By the way, just so you know mooncakes are available throughout the year not just during the Mooncake festival. Say what? Hash brown Burger? Yes you read that right! I have heard of outrageous burger combinations in the past, they are quite extraordinary and indeed delicious, like the ones we had at Boulevard Diner. Where gourmet burger makers are breaking boundaries as to what should be in your burger. And just recently the big names are making some big changes and great creativity with their burgers. Yes we have previously had 2 reviews of the chicken burgers of a particular chicken fast food company. They were liked by many, despised by some, but still it made waves of such extent that they run out of stock for a while. And now, Jollibee the no. 1 fast food chain in the country is now exploring new horizons, such as their chicken nuggets, which I don't really like and their new offering The Hash brown Burger. First opened in 1976, Old Manila has metamorphosed through the years from a 19th century-inspired restaurant with a comedor (dining room) and capiz shell-inlaid windows and wooden balustrades from when Manila was a Spanish royal city, to its present interiors of Philippine moderne and artwork by noted Filipino artist Impy Pilapil. 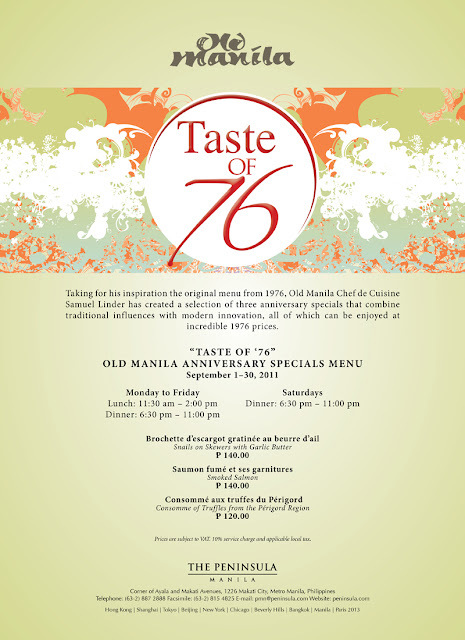 Taking for his inspiration an original menu from 1976, Old Manila Chef de Cuisine Samuel Linder will create a selection of various anniversary specials of traditional influence and modern innovation which can enjoyed at incredible 1976 prices! It will be available from September 1 – 30, 2011. The Food Alphabet at The Ultimate Taste Test!!! The day has finally arrived, Sept. 3, 2011. The day when all foodies, food lovers, food aficionados and food enthusiasts all come into one place The Ultimate Taste Test at the Rockwell Tent. Now on its 6th year of bringing in the best foods of the metro into one place to go through the stringent process of food tastes by the discerning and food fanatics alike, it promises to be an experience like no other. Only once in a year, we are given the chance to be food critics of the best delicacies the metro has to offer. Everyone at the food event, was given their own Passport and enclosed inside was rating sheet, to write down your view as well any feedback on how the food was presented to you? May it be good or bad, it serves as a complement and inspiration of the food concessionaire to do better. This year we have a total of 55 Food Finds, specially selected by the Ultimate Taste Test (UTT) review crew, to provide a food experience like no other. Troops of foodies marched their way to Rockwell tent and there foods good enough for a thousand were prepared to satisfy the hungry, the salivating and for everyone else who needed a food rush! As much as I would like to try all 55 of the great food finds, I was limited to as how much my tummy could really fathom from the mountains of food being served, even though they were just sample portions of the food, they can really fill you up. My cousin heard from a friend that there was a place in Retiro, Quezon City, serving "Taiwan's famous stinky tofu 臭豆腐" And so we finally got a chance to visit the place, and without second thoughts, we hop on to ride through that rainy night, and finally we're here, Kao-Chi Restaurant. From the outside, it looks like any ordinary Chinese restaurant, with Chinese neon signs, brightly lit to lure customers in, but when you take your first steps in.. you're like transported to another place. The interiors are adorned nicely with antiques from the Chinese dynasties, but of course with a little twist of modern pieces such as the picture on the right, where the ring of the supposed wall lion head design is lighted to a bright gold. The seats and tables are all patterned to a bright red setting, making it feel majestic and yes royalty. And so let's end the small talk and get to business.